See Our CheckList & Pricing Below! Let us help you find, uncover, discover, refine and use your passion to help people with your love of creativity. We will help you implement, sustain, manage, systematize and perpetuate your talents, new found knowledge and past and future experiences into a measurable, impacting business that reaps profits for you and then we will expand your horizons from there. Scroll down and compare our courses side by side. The green check marks indicate a component is included in that particular course. 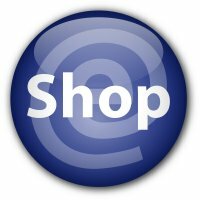 Pricing and purchase links are listed at the bottom of the check list. 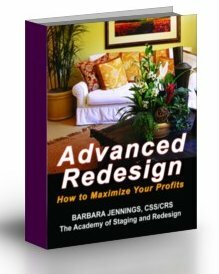 (Strategic 210 pages) Barbara's newest and exclusive training on how to build and sustain your business during downturns in the economy using cashless tactics and more. Fresh, innovative, powerful, do-able and extremely practical - not available anywhere else at any price. (260 pgs) Learn how to create your own high-powered, totally professional portfolio. 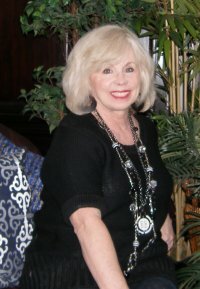 Then learn how to use it in the most easy and effective system to get all the clients you want or need. (191 pgs - Manual) Learn how to protect yourself from those that would like to skip out on paying you. In a difficult economy or a good one, there are always some people who try to get something for nothing. You don't have to be a victim. This guide teaches you essential tactics you can take to protect yourself and lessen your risks. 6 Easy Forms for Starting Out, Moving Check List, Sample Lifestyle Sheet, Open House Check List, Moving Sale Check List, Sample Features Flyer, Sample Furniture Rental, Stress Reducing Tips. 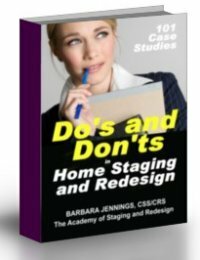 232 pages geared strictly for agents who want to learn about the benefits of home staging to give great advice but who are not professional stagers and don't want to become stagers. 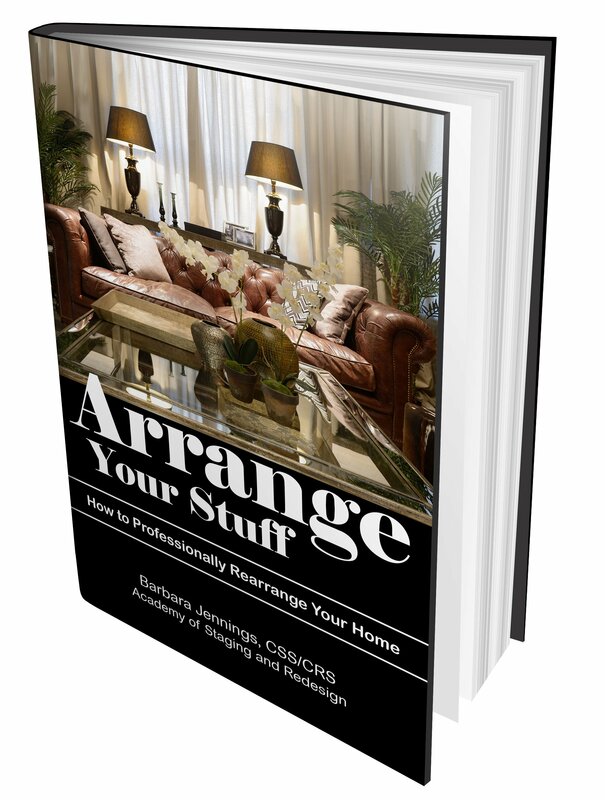 (available a la carte - 232 pages) 101 Case Studies to teach you how to professionally rearrange furniture and accessories, learning from the mistakes and successes of others thru before and after photos, comments and critiques. (180+ pages, printable eBook) Learn the art of creating floral arrangements - another dynamite service you can offer clients to boost your income. 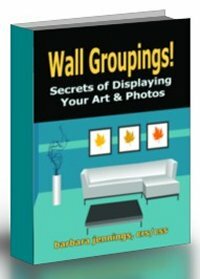 Walk into any room and know how to solve the arrangement problems and bring real solutions. Learn how to examine, evaluate, identify and observe correctly and you should never be stuck on a project. Exclusive. 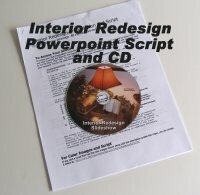 In redesign, it's important to be strong in how you group client photos and smaller art. Learn from these examples. Create your own. 35+ forms - way more than you'll possibly ever need, but there for you just in case you want them. Don't make this business complicated with over-planning. Yeah, we've got that too. Letters are best written in your own style, but if you need ideas, we've got some really good ones to share. Choosing a good name is important. It is a silent business card. 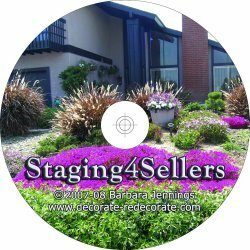 We'll give you lots of ideas - ideas for staging business, redesign business or both. Actual point by point analysis of what's wrong with targeted homes that severely need correction. Learn how to break it down from photographs and see how I think and how I analyze a home so you can do it too instantaneously on the spot. How to Take Exceptional Photographs for Your Portfolio - Learn the tricks of the trade that magazine stylists use to enhance their photographs and draw the reader into the ambience of the room. Beat your competition with your stunning portfolio of unmatched superior quality, style and beauty. 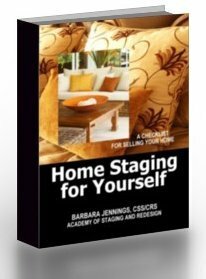 (Available A La Carte) - 105-Page Staging Check List Booklet (to-do list) to use while consulting so you never leave without a profit - eliminates having to create paperwork, forms and such and allows super easy and quick on-site customized consultations in the most impressive manner possible. Buy quantities of the booklets at a discount and pass the costs on to your client so they cost you nothing and no time needed to create. Use onsite. Staging Postcards Announce your staging business with class. Many styles to choose from. By enabling you to write Barbara for advice and help whenever you need it, we'll help you measure, monitor, analyze, quantify and figure out just what you need to do to grow, expand and multiple your profits. 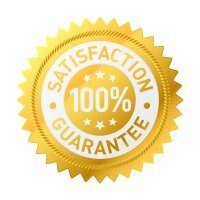 Bonuses (All Bonuses promised with each product) Our bonuses are geared to give you much higher, bigger, better and more profitable yields or results. With 2 newsletters per month you'll get easy, informative design tips you can use and even pass on to clients. With a monthly newsletter and our worldwide discussion forum, we'll give you the encouragement and empowerment you're seeking. We will help you hone your business efforts, activities and opportunities and adapt them for your own usage and benefit. Guaranteed Double Certification If you need personalized help passing the Exam and Portfolio submission, we'll help you thru it. While certification is not mandatory for success, as more and more people enter the business, it becomes increasingly more essential. Our program has "set the bar" higher so achievement is more powerful and influential in the real world than other programs that have no accountability for talent or knowledge. We understand it is very confusing these days to select the best training course or person to help you achieve your goals. So we've created this comprehensive page of frequently asked questions that hopefully will help you make the best decision for your circumstances. Please read: Answers to Questions. If you still have unanswered questions, please shoot us an email for a quick response at Please Answer These Questions or contact us by phone at (714) 963-3071 (Mon-Fri, 9:00-5:00 PST). We believe we have priced our products and courses according to the great value they will give students. 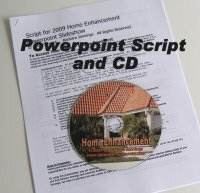 Many products offer attractive discounts. However, we are an "equal opportunity trainer" or, said another way, we offer a "one price fits all" structure. 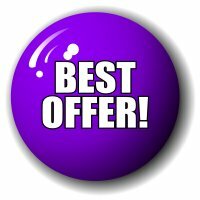 So please do not contact us asking for a personal discount, payment terms or an extended deadline on any sales we might advertise. It is against company policy to give a price benefit to one person that isn't offered to everyone. No exceptions. Harv Eker, in his best selling book "Secrets of the Millionaire Mind", says "Rich people focus on opportunities. Poor people focus on obstacles." No words were more true than for those considering the start of a new business. He goes on to say, "Poor people make choices based upon fear. Their minds are constantly scanning for what is wrong or could go wrong . . . their primary mind-set is "What if it doesn't work?' . . . Rich people take responsibility for the results in their lives and act upon the mind-set 'It will work because I'll make it work.' Rich people expect to succeed. They have confidence in their abilities, they have confidence in their creativity, and they believe that should the doo-doo hit the fan, they can find another way to succeed. . . . Because they constantly see opportunity, rich people are willing to take a risk." So the question is, Do you want to be a rich person or remain a poor or middle class person?